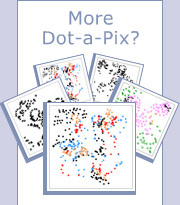 Each puzzle consists of a collection of dots with clues next to each dot. The object is to reveal a hidden picture by connecting the dots in ascending order starting with 1 and ending with the highest number. Each puzzle consists of a collection of color dots with clues next to each dot. The object is to reveal a hidden picture by connecting the dots in ascending order and according to their color starting with 1 and ending with the highest number. Each puzzle consists of a collection of B&W or colored dots and stars with clues next to each symbol. The object is to reveal a hidden picture by connecting the dots and stars in ascending order starting with 1 and ending with the highest number. Whenever reaching a star, the line is terminated and continued from the next dot. In the case of color puzzles, the color of the lines should be the same as the color of the dots.